Halfway into this cross country season, Tech’s Jeremy Greenwald has finished ahead of every collegiate runner he has raced and is helping to propel his team to new heights. The season began over a month ago in Athens, where Greenwald and the Jackets defeated both Georgia and Mercer at the UGA Invitational. Two weeks later at the Florida Mountain Dew Invitational, he pulled away from the pack and crossed the finish line in a career-best 24:17, giving Tech the first place finish over 11 other teams. Greenwald followed that with a first place time of 24:58, 10 seconds ahead of the next finisher, at the Upstate Invitational to help the Jackets take second place in the event. Greenwald feels that based on the amount of training and dedication he has put into improving as a runner, the success that he has achieved so far is fully expected. However, he does not feel that these wins have put a lot of extra pressure on him. From here, Greenwald believes that the team has the potential to compete for a top spot at regionals and earn a spot at nationals. At the very least, he hopes to make it to nationals as an individual and represent the team should they not qualify. Greenwald competes for the Jackets in all three seasons: cross country and indoor and outdoor track. He feels he has grown as a runner over the past three years, both mentally and physically. He attributes his success as a cross country runner to his aerobic fitness, which becomes strengthened through long runs with the team on Sunday mornings. He rarely ran over 10 miles at a time in high school but is now running 16 to 18 miles every weekend at a considerably faster pace. He ran a total of about 85 miles a week ago, which he says was the most all season. To put that into context, some NCAA powerhouses run upwards of 100 miles every week. Greenwald puts the biggest emphasis on running track, though success in cross country is also important to him. Greenwald prides himself on excelling in a wide range of races, from the 800m in the outdoor season to 10 km races in the fall. “I don’t want to be a one-race type of guy. I enjoy track a lot more, but I love doing all of the seasons,” Greenwald said. Since he is a track runner first and foremost, he must run a patient race in order to not tire himself out too soon. He does not push the pace, as the best pure cross country runners will be able to maintain that pace and win on stamina at the end. Instead, he stays near the lead pack for the majority of the race, and uses his mile speed down the home stretch to hopefully pull ahead at the finish line. With a lot of young, inexperienced runners on the roster, Greenwald has an important leadership role on the team. He leads by example, doing exactly what his coaches tell him to do and taking care of himself properly outside of practice. Greenwald says that his biggest motivator is the fear of having regret later in life and that it pushes him to achieve as much as he can in the present. 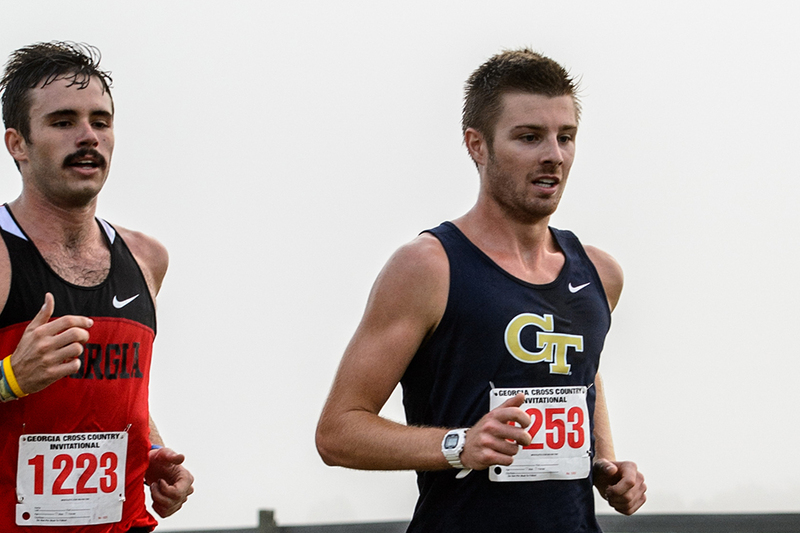 No matter how the rest of his collegiate career at Tech plays out, Greenwald plans on running competitively long after graduation.